Following new features have been added to IIS configuration system and appcmd command line tool in IIS 7.5. In IIS 7.5, IIS native configuration system can generate trace events capturing all IIS configuration activity. Because all IIS administrative tools (WMI, appcmd, MWA, UI, Powershell etc) call into native configuration system, events are generated irrespective of which administrative tool is used to read/write IIS configuration. Tracing is not enabled by default. You can go to “Application and Service Logs->Microsoft->Windows->IIS-Configuration” in event viewer and enable tracing. IIS generates 4 kinds of events. These are administrative, operational, analytic and debug. Right click on areas in event viewer and select “enable log” for categories you want to enable tracing. IIS configuration system has the ability to work with multiple .net versions. For this configuration system honors metadata defaultManagedRuntimeVersion. If set, IIS will use this information to find which machine.config and root web.config it should work against. Default version assumed is v2.0. If you want to make configuration system go against other .net version, you are required to set defaultManagedRuntimeVersion metadata. If the configuration path identifies an application, configuration system automatically figures out the version by checking managedRuntimeVersion set for the application pool for the application. All administrative tools are updated to allow working with different versions of NetFx. 3. Shared configuration now can be configured to use polling instead of change notifications to track changes to applicationHost.config file. This can be configured by specifying “enableUncPolling” and “pollingPeriod” properties in configurationRedirection section. Default value of enableUncPolling is false which means the feature is not turned on by default. 4. “availableReadableMetadata” and “availableWritableMetadata” metadata properties are available in IAppHostAdminManager, IAppHostElement, IAppHostMethod, IAppHostProperty interfaces. These can be used to find what readable and writable metadata is available for each object. 1. Appcmd now has ability to add <clear/> tag in the collections using ‘~’. Command to clear <error> collection entries in httpErrors section will be following. 2. Previously appcmd could only add one type of addElement collection type which limited its utility for authorization section as the addElement could be allow or deny. Now appcmd can be used to add element of a paricular type. Command to add deny entry in authorization section will be as following. 3. /clr switch can be used to specify which version of .net framework you want to work against when dealing with machine.config and web.config. If this switch is not specified, version dotnet version 2.0 will be assumed.appcmd list config /section:profile /clr:4 (or v4 or 4.0). Here are some of the cool things you can do by piping appcmd commands together in IIS7. Here are the steps you need to enable tracing for a site using appcmd. 1. Enable tracing for site. 2. Enable tracing for all request paths and for all response codes. 3. Appcmd leaves verbosity to default value “warning”. Get the providers count to change verbosity in step 4. 4. Change verbosity to verbose for all providers. @REM Change /statusCodes if you don’t want to enable tracing for all response codes. @REM Status code range doesn’t work in vista client. Change accordingly. You can remove step3 and change step 4 to run blindly from 0 to 3. You might get invalid index errors from appcmd if you have less than 4 providers installed on your machine which you can ignore. Do you always find yourself using “/?” in appcmd to find what switches you need? Do you always run “appcmd list” commands to see the list of apppools/sites/apps/traces etc before actually running the command? Do you always end up opening schema when working with "appcmd config" commands? Worry no more. I have written AppcmdUI to alleviate your pains. AppcmdUI provides you available options at each step so that you only need to pick the option from the list as in the snapshot below. § Works with both “appcmd <object> <verb>” and “appcmd <verb> <object>” command styles. § Shows list of objects and verbs available. Builds auto complete list dynamically so that you see only few options. § Builds list of current application pools, sites, applications, virtual directories, backups, module, traces, worker processes and shows them as parameter values. Updates this list when “appcmd add/delete” commands are used. § Force update option for tool to pick latest configuration data when “appcmd set config” or other scripts/tools are used to add/delete apppools/sites/apps/vdirs. § Parses the schema and shows section names in commands which require section names. Custom defined sections are automatically picked. § When working with a particular section, shows list of attributes/elements/collections and helps you setting attributes and adding/removing collection elements. § Shows attributes, elements, collections which you can set using “appcmd set apppool|site|app|vdir|module” commands. § Shows general appcmd parameters. Uses –parameter for general parameters rather than /parameter to show they are different. § Shows possible attributes when “appcmd –text:” used. § Can execute command and see the output in the same window. § Shows examples of commands you are working with which are in “appcmd <verb> <object> /?” help. § Supports auto complete and command execution even when piping commands together. § Limited support for identifiers. There is a corresponding /parameter option for most of the identifiers. Uses /parameter:value. § NEW – Up-down lets you browse recently executed commands. § NEW – If you run the application without sufficient privileges, it shows UAC dialog box for you to grant access. You can use AppcmdUI only on machines which has IIS7 and appcmd.exe installed. Download attached AppcmdUIInstall.zip and run self extracting package AppcmdUIInstall.exe. Extract files (AppcmdUI.exe and AppcmdUI.xml) to a folder on your machine and you are done. Run AppcmdUI.exe as elevated (newest version will demand administrator access if needed only if when you don't run it from command window). Running from an elevated command prompt is not enough because of UAC settings for applications which are not under windows directory. Start typing appcmd commands in the textbox. You will get list of available options as you go along. Use mouse or down/up arrow keys to select any of available options. Auto complete list is updated every time you type space/comma/colon/dot so that you only see few options which are valid in current context and helps you choose only next option. Snapshot below shows list of available objects in appcmd which are shown on typing “appcmd “. AppcmdUI uses “appcmd <object> <verb>” format. So you see list of available objects after appcmd. If you type “appcmd <verb>” and then space, you will see list of objects which you can use with the verb you typed. If you want to get list of verbs and not objects when you type “appcmd “, you can set <verb> <object> option in the menu as shown below. When you have the <verb> <object> option set, you will see the available verbs after appcmd as shown below. Once you have selected verb and object, you will see list of available options which can be used with them. When you need the available application pools, sites, applications, virtual directories, backups, traces, worker processes in the command, AppcmdUI shows the values you can use. 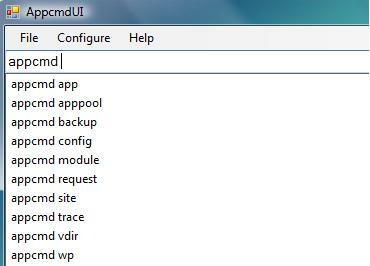 Next time when you need to start or stop apppools/sites, delete apps/vdirs or inspect traces, you won’t need “appcmd list” command first. AppcmdUI picks up list of application pools, sites, applications, virtual directories, backups once and update this list only when “appcmd add/delete” calls are made. If you use “appcmd set config” call or some other means of creating apppools/sites/apps etc, you would see the list is not updated. Eg. 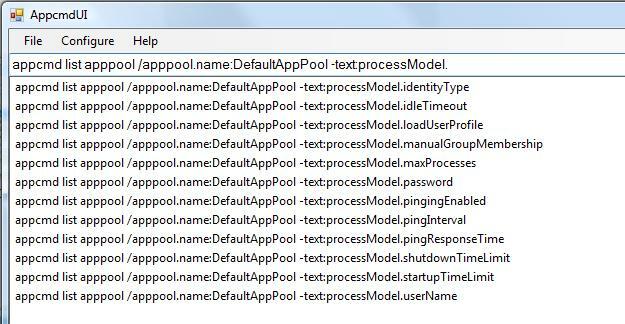 If a new application pool “AppcmdAppPool” is created using “appcmd set config /section:applicationPools /+[name='AppcmdAppPool']", that apppool is not shown in the list of available apppools. You can use "Force Update" option to force AppcmdUI to update list of application pools, sites, applications etc. After forcing an update, "AppcmdAppPool" is shown in the list of available application pools. 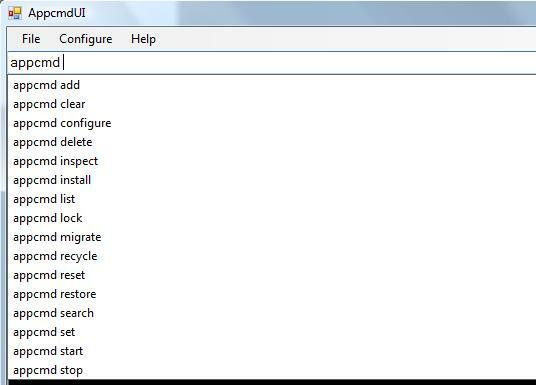 When you are working with “appcmd list config” or “appcmd set config”, you get list of available sections as soon as you enter “/section:” as shown below. 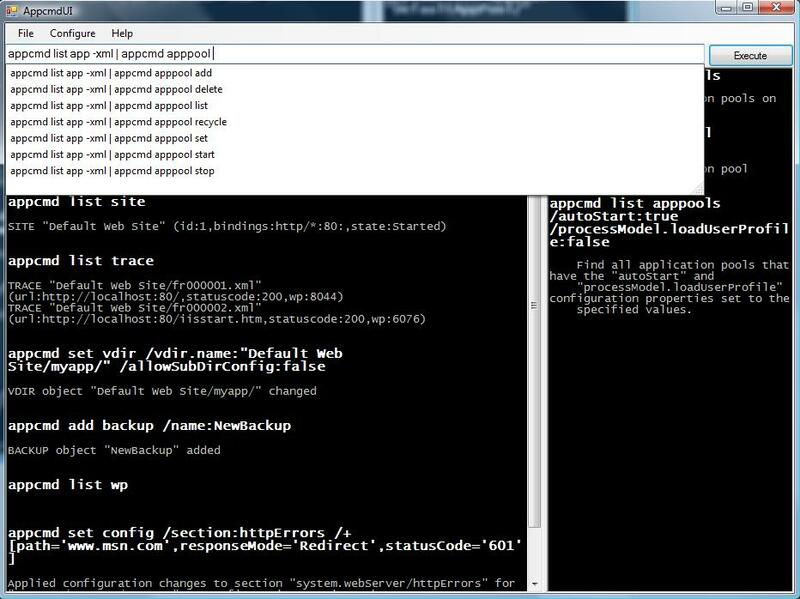 AppcmdUI also shows you list of attributes, elements, collections when working with set/list commands. Adding a collection element is now a whole lot easier as you can see below. List of attributes, elements, collections is also available when you work with “appcmd set <apppool|site|app|vdir”. In the snapshot below, I am getting attributes which can be set for a virtual directory. Schema elements are available with various list commands as well after you type “-text:”. –text with list command allows you to print only particular attributes. Hope you find working with appcmd much easier with this.